When talking about the art of special effects, Alfred Hitchcock's name may not come quickly to mind. It did, however, to Martin Anderson. Two Hitchcock movies made the list, including Frenzy (an inspired and astute choice, ranking #23; see it here.) and The Birds (a more obvious, but still astute, choice, weighing in at #6; see it here). 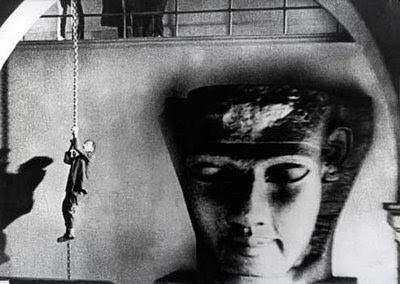 The fact is, Hitch had long had his hand in the special effects game and was eager to use the latest techniques in order to further the interests of any film he was making. Back in the silent days of early British cinema, he used the then-cutting-edge Shufftan process, which involved placing a specially-designed mirror at a 45 degree angle in front of the camera. When aimed at an off-camera model, painting or photograph, it superimposed over a live scene a setting that was otherwise unshootable for budgetary or technical reasons. He used this process in The Ring (1927), Blackmail (1929) and other films. The rooftop chase in Blackmail was shot using the Shufftan process. 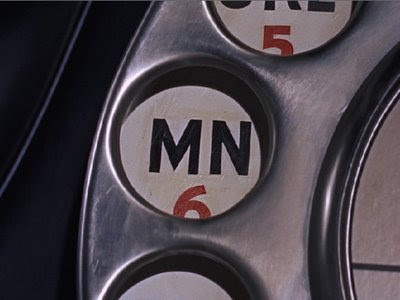 Remember the extreme close-up of the finger and phone dial in Dial M for Murder? That was achieved using a giant wooden finger and enormous phone dial he had built when he discovered that 3-D cameras (the format in which the film was originally shot) couldn’t move in close enough to get the shot he wanted. The source of Scottie's (James Stewart) uneasy feelings. Come to think of it, there’s hardly a Hitchcock film that doesn’t include special effects, which he and his collaborators often had to invent from scratch. Hitch refused to allow the technical limitations of the medium to prevent him from realizing (if that’s the right word!) the ideas he envisioned. What he left behind is a body of work that is still being examined by students of the craft. One of the delightful things about Hitchcock's use of special effects was that they always enhanced the story line and didn't attempt to become the story. Modern movie makers have a great deal to learn from that. One modern movie that seems to get it in this area is The Curious Case of Benjamin Button. Joel, you have an excellent site here! I find myself amazed at Googling Alfred Hitchcock and finding him having been praised for special effects. This causes me to question whether there were different levels and types of special effects, some that were exceptional and that I do not remember, and a second group that stand out in my mind as having been major distractions from my being engrossed in the movie because they were, to use a term from those experiences in the '50's and 60's, "hoakie," or jarringly unrealistic . 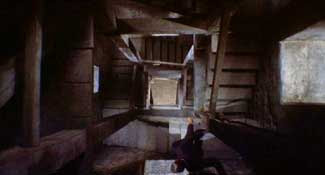 James Stewart falling and flailing and waving his arms in Vertigo, if I'm recalling correctly. The pursuer (Martin Landau I think) in North by Northwest when he falls from the face of Mount Rushmore. (No play on words intended.) And, for me, so many of the "special effects" scenes in The Birds destroyed any "suspension of disbelief. There is a One Day University presentation on Genius that includes a lecture on Alfred Hitchcock, and that prompted me to make a threshold search. I hope to attend. But "Reality" in most special effects would seem to me to be absolutely essential. I'm not talking about the concept of The Birds, but of the presentation on film.